Our conference rooms can be hired for a variety of functions such as business meetings, training courses, corporate presentations, product launches, panel interviews and committee gatherings to name just a few. Our larger room caters for up to forty delegates and the layout can be arranged either for seminar/lecture use or - with the addition of tables - as a training/workshop environment. It can be used for educational or training purposes, business presentations and corporate events. Our staff can offer advice and help with your requirements, ensuring that you take full advantage of our audio-visual equipment. The conference rooms can be hired on a room only basis or with the addition of tea/coffee and lunch for your delegates. Our smaller conference room - the Anwyl Room - is ideal for smaller meetings and events and can accommodate up to eighteen delegates. 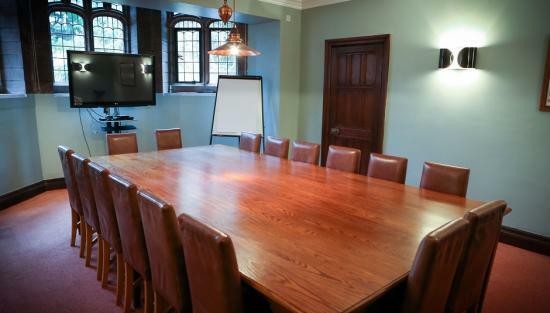 This charming room is popular with organisations wishing to hold their meetings somewhere with a different ambience. Once again, we can offer tea/coffee and lunch for your delegates. Conference room hire only (per session e.g. morning, afternoon or evening): Lecture Room £37.50 per session, Anwyl Room £27.50 per session, Wickham Room £17.50 per session. Regular conference room users may apply to the Warden for preferential rates.